Leading Technology in Body Detoxification Modern day living, stress, poor diet and the environment, all introduce toxins into our bodies. Though we are exposed to these substances in only very small doses, over time our bodies can accumulate a wide range of toxins, which they are unable to excrete. These toxins cause an imbalance to the natural energy within our cells. It is the natural function of our cells to absorb nutrients and excrete waste products. Any imbalance can prevent the cells from performing this function efficiently. Energy medicine is a modern field with 5,000 year old roots. It adopts traditional healing methods, integrates them into modern settings and is practised in hundreds of different ways. Energies, both electromagnetic and more subtle sources, form the dynamic infrastructure of the physical body. The health of those energies in terms of flow, balance, and harmony is reflected in the health of the body. 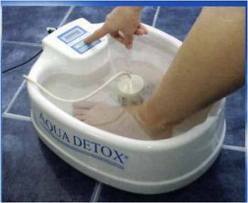 Aqua Foot Detox™ The revolutionary way to detoxify and re-balance your body Aqua Detox has been employing Doctors and Scientists to research the effectiveness of the Aqua Detox treatment. We now have scientific research showing how the use of Aqua Detox can benefit the body’s: * Blood Cells * Vitality * Organ Energy Levels The AQUA DETOX advantages: * No sweat * No exercise * No funny drinks * No special diet How does Aqua Detox work? Bio-Energetic Stimulation for Self Detoxification When the apparatus is turned on and the array is immersed in the water, the unit creates the electrolytic flow (a flow of electrons) which imparts to the water a bio-energetic field which corresponds to that of the person using the apparatus. This allows a gentle Bio-Energetic Resonance to travel through the body. Bio-Energetic stimulation has a positive effect on the microcirculation of the body. If the microcirculation is good, the body is more likely to be healthy. When there is an imbalance, there is more likely to be a dysfunction. As the body re-balances its Bio-Energetic Field it plays an important part in regulating both supply of Oxygen and nutrients to the tissues and the proper excretion of waste products (toxins) out of the body. The body is therefore more likely to be healthy, allowing the body to restore its natural healing energy levels. What are the health benefits of Aqua Detox? 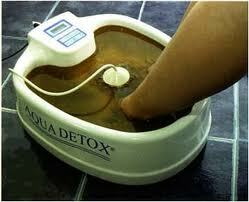 Medical Research The latest research shows that Aqua Detox : * Increases energy levels by at least 24%. Even after the first treatment, by allowing nutrients to pass into the cells * Significantly increases circulation to the legs * Releases harmful phosphates and nitrates from the body * Supports kidney function as is shown by traces of ammonia in post- treatment water * Re-balances the PH of the blood * Removes impurities, energises cells and limits free radicals Blood cells BEFORE an Aqua DetoxTM treatment: high degree of acidosis, toxins and bacteria and low levels of anti-bodies, oxygen and corpuscles. Blood cells AFTER an Aqua DetoxTM treatment: normalised blood and acidity levels, significantly reduced levels of bacteria and pollution, with increased levels of antibodies, oxygen and energy in the cells. How are the treatments administered? Aqua Detox treatments are usually given through the feet, as this is both convenient and since each foot has over 2,000 pores through which toxins can be excreted very efficiently. The array can also be placed in the bath so that most of the body can be immersed. This is especially useful for the treatment of very young children and babies. What happens during a treatment? 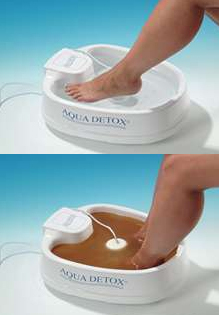 * You immerse your feet in warm water within the Aqua Detox™ machine * We set the machine to the correct settings and ionisation levels * Then you sit back & relax for 30 minutes whilst the Aqua Detox™ completes its cycle of treatment * You’ll see the excreted toxins in the water * The water will change colour and consistency – from orange, brown through to black * There may be lymphatic fat or mucous floating on the water * Well-being is enhanced from the first treatment * Detoxification is complete normally within 5 -7 treatments over 2-3 weeks * Endorsed by many leading alternative therapists including the World renowned Is It Safe? Medication will not be affected at all. If in doubt, please consult your doctor. How many treatments should I have? To achieve the maximum benefit from Aqua Detox it is recommended that clients should have a minimum of 6 treatments over a 4 week period. This provides a good initial detoxification. Thereafter the frequency of treatments will be decided by the patients’ own view of his or her general health with their practitioner. It is recommended however, that the frequency should not exceed one treatment every two days.